Eurocampers focuses on making your visit to New Zealand a magnificent experience. Eurocampers Ltd was founded in 2003. Its aim is to give visitors to New Zealand the opportunity to choose a smaller campervan rental company, which believes in personal service and attention to detail. The business has based its operations in the heart of Matakana Wine Country, on the Kowhai coast, just an hour north of Auckland. A place of quiet beauty, the area boasts great wine, fabulous local cuisine and world class accomodation. The area provides a superb platform to start or finish your holiday. We have Depots in Warkworth Auckland and Christchurch. Our vehicles are EUROPES BEST LOVED CAMPER - For your safety and comfort we have chosen to provide you with a selection of luxury Volkswagen vehicles. Two long wheelbase models are available. 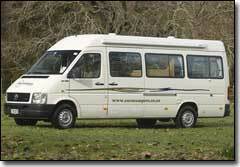 The (2004) T4 Transporter 'Explorer' Campervan is available in a 2 Berth and a 3 Berth option. The (2005) VW LT 'Cruiser' Motorhome features shower / toilet and is available in a 2 Berth and a 4 Berth option. Post : BREAKAWAY, 409 Heretaunga St East, Hastings 4201, New Zealand.